Magnetic resonance imaging (MRI) uses a powerful magnetic field, radio	frequency pulses, and a computer to produce detailed pictures of organs,	soft tissues, bone, and virtually all other internal body structures. It is especially useful in orthopaedics for obtaining images with detailed	contrast between the soft tissues of the body, such as muscles, ligaments,	cartilage, and other bone or joint structures. Our	extremity MRI provides a more comfortable experience than traditional closed MRI for	evaluation of injuries to the arms and legs. 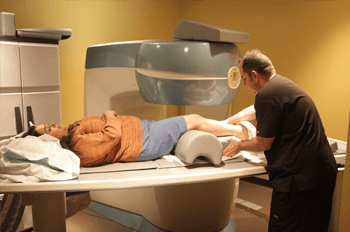 Experienced MRI staff make the process comfortable and easy for our patients. Our	Esaote S-Scan MRI system provides complete musculoskeletal imaging capabilities in an open,	comfortable environment. This S-Scan covers all applications: foot/ankle,	knee, hip, L & C spine, shoulder, elbow and hand/wrist. The wide rotating	patient table guarantees easy patient positioning and patient comfort. 1. How long will the exam take? 2. How should I prepare for the MRI exam? You can eat, drink and take regularly-prescribed medications prior to the	exam. If you will be having a leg exam, you can bring some shorts to wear. Otherwise, you may be asked to change into a hospital gown to avoid any	possibility of interference from metal in zippers and fasteners. You will be asked to remove your watch, credit cards, jewelry, keys, pocket	knife, hearing aid or any other metal objects before approaching the MRI. The magnet could affect the items of this type or the items could affect	the magnet. 3. What do MR images look like? MR images look a lot like a conventional x-ray; however, they provide much	more detailed information. The images will be provided to your physician	or radiologist for interpretation. 4. Will I feel anything? No. There is no pain, vibration or unusual sensation. The MRI will produce	a mild tapping sound during the exam. 5. What is MR Imaging? MRI is a way of looking inside the body without x-rays. The exam uses radio	waves and a magnetic field to create images of the soft tissues of the	body. These images are then transferred onto an x-ray film so the doctor	can interpret them. 6. How is the MRI performed? You will be asked to lie on the table and the technologist will position	you comfortably. The table will be slid sideways into the open magnet. Only the extremity being imaged will be in the magnet, so your head and	body will remain outside the magnet. You will be asked to remain still	during the examination. 7. What do I need to do during the exam? Nothing! Just lie on the exam table and relax. You will be free to read	or sleep during the exam. 8. What if I have more questions? Your physician or the MRI technologist will answer any questions you may have.